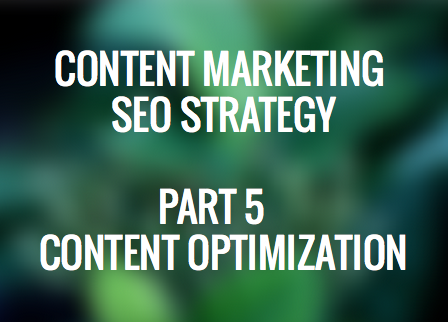 This is part of a 5 part series on our content marketing SEO strategy. This is the last blog post in this series. We’ve talked about how content plays the most crucial role in your SEO results and rankings. The keywords you chose play a role, your blog posts play a role, your Social media and landing pages also play a role. Now to tie it all together, let’s talk about how optimizing your content can also help you achieve those results you are looking for. Content optimization is a good thing. Over optimization is a bad thing. The reason is simple. Google and other search engines really want their users to find what they are looking for. What are they looking for? Good content. Content that is over optimized or stuffed with keywords is bad. Real content that applies to the searcher, that’s good content. But having great content isn’t always enough. You also need to make sure your website and content is ready to receive. With that said, there are some things you can do to your content to help it rank better over time. And we’ll get to that in this blog post. But first let’s talk about one thing that can be hindering your success without you even knowing it. If you have errors on your website you are not going to get the results you deserve if you are doing everything else right. 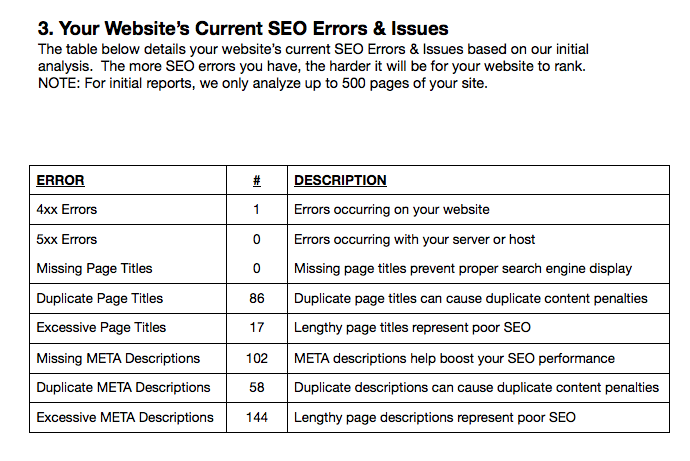 Errors are a bad thing for SEO and it’s your goal to eliminate them. There are different kinds of errors you need to know about. This image is from a report we pull for our clients and prospects. Note that it is pretty much impossible to get rid of all errors, but the lower the better. That’s your goal. Now that you know where your errors are on your website, how do you go about optimizing the content and fixing them? These errors occurs when you link to pages that are no longer there. You need to fix those links or set up permanent redirects. This is a server side error and sometimes servers go out. You can’t really fix this. The server guys have to fix it. Unless your website is causing your server to crash. But that’s a different issue. There are a few errors that pop up here and they can be addressed together. Missing titles, excessive titles and duplicate titles. Duplicate is the worst. Don’t get lazy. Each page needs to have a unique title. Titles should be in between 30 and 65 characters. Meta descriptions are the black text that shows up under the link on Google and other search engines. These should be in-between 70 and 156 to be optimized. Again, don’t get lazy and use the same for all. Duplicate content is a series issue. Images should also be optimized. They should be labels correctly and have the right tags. To learn more on how to do this see here. Links are a good thing for SEO. There are two types that you need to know about. Internal and External. You need both. Internal is when you link from within your site to another page or landing page on your site. Just make sure you don’t over optimize your internal linking. You want the links to be natural. The other type of linking is external. This is when others are linking to you. You want to increase the amount of links coming to your site but again it has to be NATURAL. Don’t buy links. You also want to include out ward links from your site. Not only does it help you build relationships with other bloggers and site owners in your niche and industry, it is a good SEO practice. Great post! I am new in SEO I didn’t know those kinds of errors. Thank you it will help me a lot for my blog.